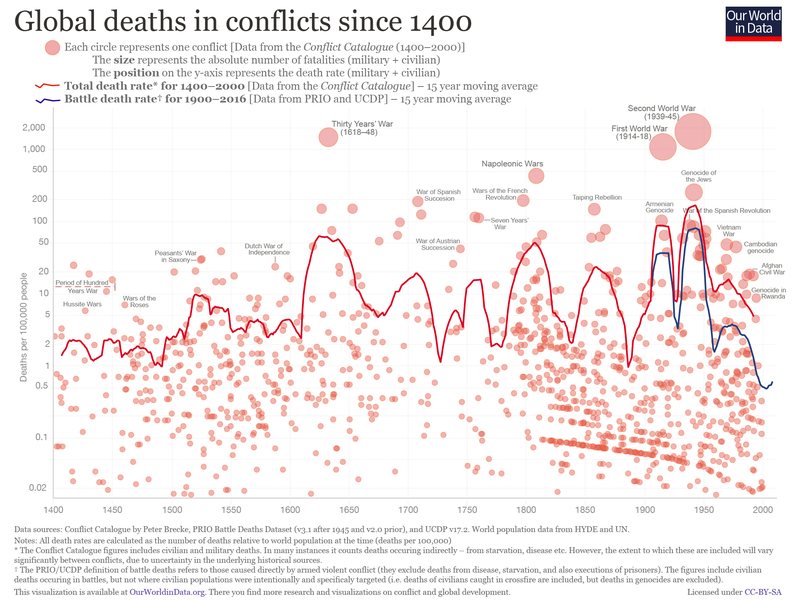 We also published a data visualization history of human violence here on OurWorldInData.org which presents empirical data showing that we are now living in the most peaceful time in our species&apos; existence. It would be wrong to believe that the past was peaceful. One reason why some people might have this impression is that many of the past conflicts feature less prominently in our memories, they are simply forgotten. An overview of all the conflicts for which we have an estimate of the number of fatalities is shown in the visualization below. The red circles visualize the conflicts listed in the Conflict Catalog authored by Peter Brecke. Brecke&apos;s dataset contains information on 3708 conflicts, but for the more distant past it is still incomplete. Brecke is lacking an estimate of the number of fatalities for many past conflicts, and we can suspect that the existence of many conflicts is unknown altogether. 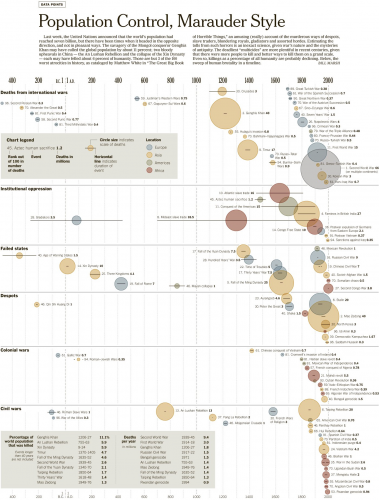 In addition to the individual conflicts, the death rate from all conflict across the globe is shown. (The red line uses the Conflict Catalogue data, and the blue line uses a dataset constructed from PRIO and UCDP data). CLICK HERE to see the infographic in more detail. The absolute number of war deaths has been declining since 1946. In some years in the early post-war era, around half a million people died through direct violence in wars; in contrast, in 2016 the number of all battle-related deaths in conflicts involving at least one state was 87,432. The decline of the absolute number of battle deaths is visualized in the following graph that shows global battle deaths per year by world region. There are three marked peaks in war deaths since then: the Korean War (early 1950s), the Vietnam War (around 1970), and the Iran-Iraq and Afghanistan wars (1980s). There has been a recent increase in battle deaths driven by conflict in the Middle East, particularly in Syria, Iraq and Afghanistan. The chart above refers only to battle deaths occurring in conflicts that involved at least one state on one of the opposing sides. For more recent years, we show these &apos;state-based&apos; conflict deaths alongside battle deaths in &apos;non-state&apos; conflicts (where two or more organisations are fighting but no state is involved), and also violent deaths in &apos;one-sided violence&apos; (where there is only one organised aggressor, such as in genocidal violence). We see that, in recent years, state-based conflicts form the majority of such deaths, though the genocide in Rwanda in 1994 stands out for its very high death-toll. The previous two graphs showed absolute numbers, but as the world has seen rapid population growth (see our entry on global population growth), it is more appropriate to look at relative numbers. 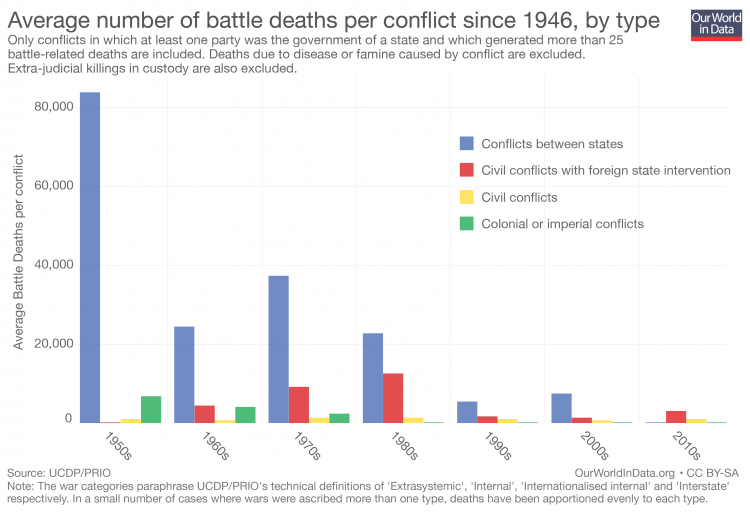 Here we show the battle death in state-based conflicts per 100,000 people per year. The figures are shown by type of conflict. As we have seen, the number of war victims varies hugely between different wars; whereas 1,200,000 died during the the Korean War (1950–1953), other wars had &apos;just&apos; 1,000 victims. For this reason, statistics on the number of wars should not be considered without information on the size of these conflicts. 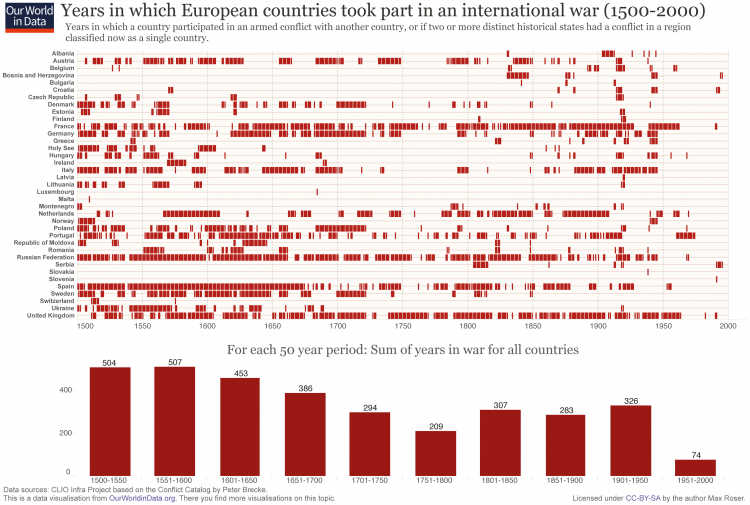 The following figure shows that the overall number of ongoing conflicts each year has increased, as compared to the immediate post-WWII period. This increase however only relates to civil conflicts within states. Conflicts related to the expansion or defence of colonial empires ended with decolonisation. Conflicts between states have almost ceased to exist. The increase in the number of wars shown before is predominantly an increase of smaller and smaller conflicts. This follows from the previously shown facts that the number of war victims declined while the number of conflicts increased. The decreasing deadliness of conflicts is shown in the following graph. Information on ongoing wars that is always up-to-date can be found at Wikipedia&apos;s List of Ongoing Military Conflicts. A conflict is coded as a war when the battle-death toll reaches 1,000 or more in a given calendar year. An extrastate armed conflict is a conflict between a state and an armed group outside the state’s own territory. These are mostly colonial conflicts. An interstate armed conflict is a conflict fought between two or more states. An intrastate armed conflict (also known as a civil conflict) is a conflict between a government and a non-state group that takes place largely within the territory of the state in question. An intrastate armed conflict becomes an internationalized intrastate armed conflict when the government, or an armed group opposing it, receives support, in the form of troops, from one or more foreign states. For more information on definitions visit the website of the Human Security Report. 2. The PRIO, UCDP & Human Security Reports PRIO and UCDP collaborate to build the data set on wars. This data set is the base for the annual publication of the Human Security Project and for most of the data in this post. Data on on civil conflicts for the period 1945–99 was collected by Fearon and Laitin and can be found here. The Conflict Catalog (Violent Conflicts 1400 A.D. to the Present in Different Regions of the World) authored by Peter Brecke contains information on 3708 conflicts, data on parties, fatalities, date and duration between the year 1400 and 2000. It is available at the Center for Global Economic History here. 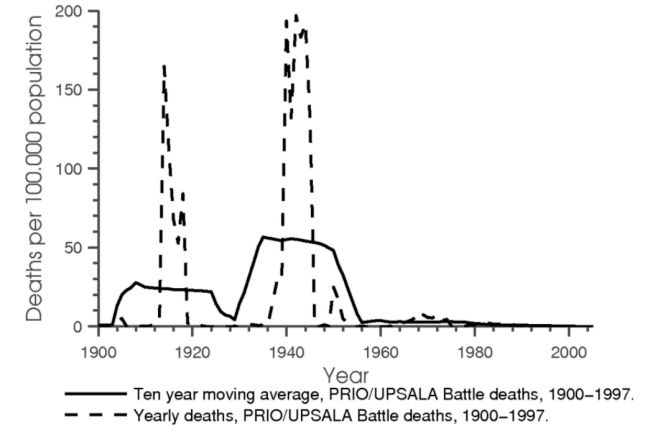 The Battle Death data from 1900 is constructed by combining PRIO Battle Deaths Dataset v.3.1 and v.2.0 and the UCDP Battle-related Deaths dataset, v.17.2. These are available at the organisations' respective websites, here and here. These data are taken from the CLIO Infra Project. The original source of these data is the Conflict Catalog by Peter Brecke, which you can access directly here. 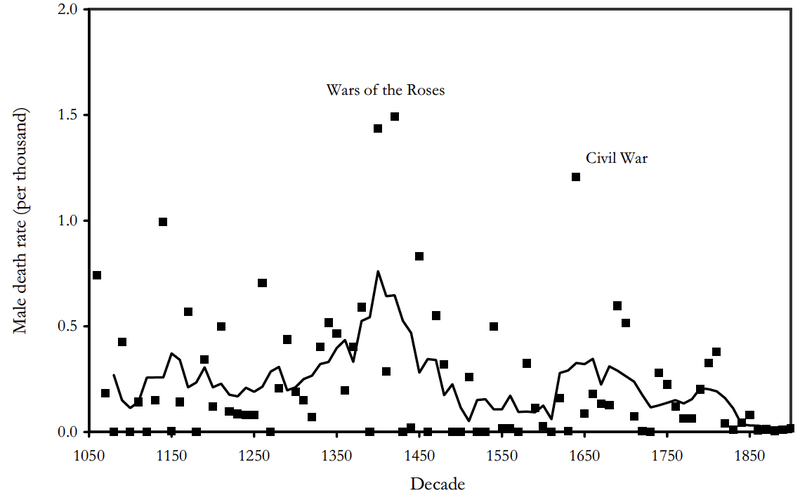 The data are taken from figure 5-12 in Pinker (2011) – The Better Angels of Our Nature: Why Violence Has Declined. Viking Adult. The line shows a fifty year moving average of combat death rates in England. The article is online here, and the list can be found in the appendix. 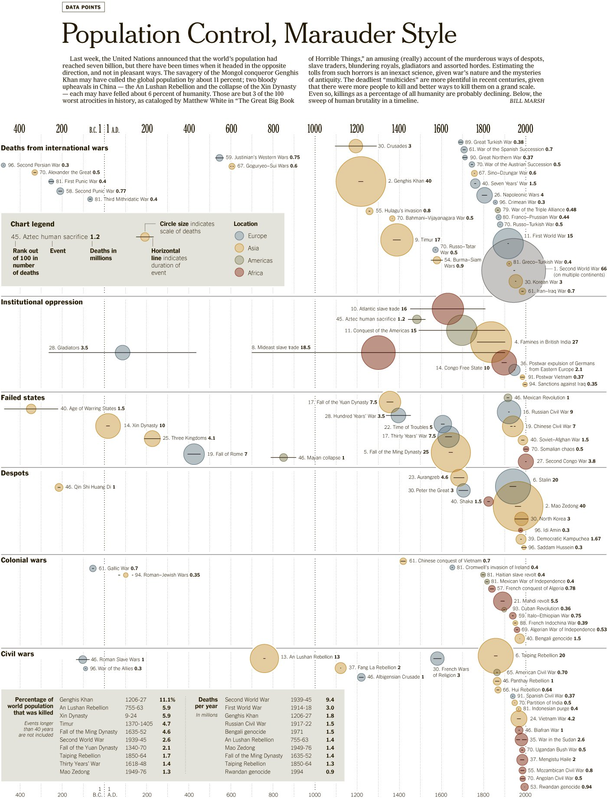 This infographic is taken from the New York Times; the original is here. The source of the data is White (2011) - The Great Book of Horrible Things - The Definitive Chronicle Of History's 100 Worst Atrocities. W. W. Norton & Company. Acemoglu (2012) - The world our grandchildren will inherit: the rights revolution and beyond. Essay prepared for Economic Possibilities for Our Grandchildren edited by Ignacio Palacios-Huerta, MIT, 2012. The article is online at the website of the MIT here. 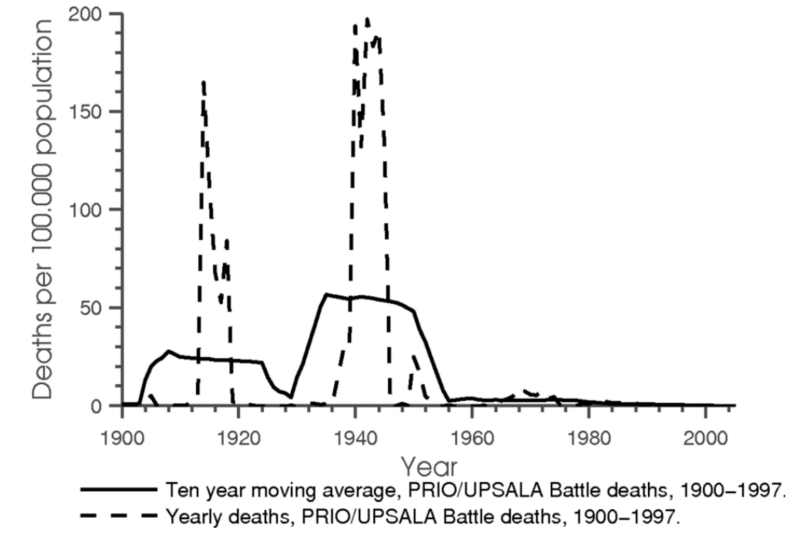 The data used for this figure are the “best estimates” from the PRIO-UPSALA dataset from Lacina and Gleditsch (2005) - 'Monitoring Trends in Global Combat: A New Dataset of Battle Deaths', European Journal of Population vol. 21(2–3): 145–166. The website of the PRIO database is here. International battle deaths are those recorded in conflicts between two or more recognized states. For more information on this claim have a look at Mueller (2009) - War Has Almost Ceased to Exist: An Assessment. In Political Science Quarterly, 124, 2, 297--321. and Pinker (2011) – The Better Angels of Our Nature: Why Violence Has Declined. Viking Adult.